We look forward to receiving your pet photos, at walltownship@pinotspalette.com, by May 20. A GREAT pet portrait starts with a GREAT photo! * Pet is centered in the photo either FULL BODY or HEAD SHOT, with no cropped off edges. * Our best advice is to take a photo of your pet with the best camera you have outside during the day, under a shaded area (like your front porch, back patio, or inside near a window). Remember, the better your photo is, the easier the painting process will be. * Your pet photo will be printed directly onto the center of 16x20 canvas in black and white with a few shades of gray. This will allow you to create the best and most detailed masterpiece possible! We will also provide you with a 4x6 copy of the original photo you sent in, for your reference during class. 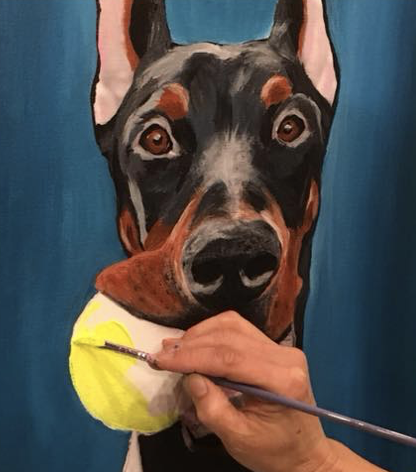 * Based on the colors of your pet, primary colors and popular colors, your paint palette will be ready for you when you come in. However, if you are not pleased with the colors provided or would like to add more colors, feel free to help yourself to the paint cart at any time during class. Please feel free to call or email with any questions regarding your pet photos. We are here to help you paint a beautiful portrait you will admire for years to come! Thanks and we look forward to painting with you soon!